Yes , food stamps have doubled under Obama. What Conservatives who have a pre-conceived hatred of Obama won’t tell you , is that they also doubled under Bush. 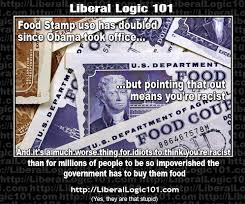 That would destroy their myth of Obama being the food stamp president , and that most of its recipients are minorities , the lazy moochers. Liberal Logic 101 … yes , they are that stupid … and that racist.